Facebook says no to ICO ads but allows promotion of phishing websites. This morning I thought that I traveled back in time after checking the crypto market and seeing the ads served by Facebook. I was honestly thinking that refurbished laptops and various scams that could be found on Facebook were a thing of the past. To keep this as short as possible let's get to the point. 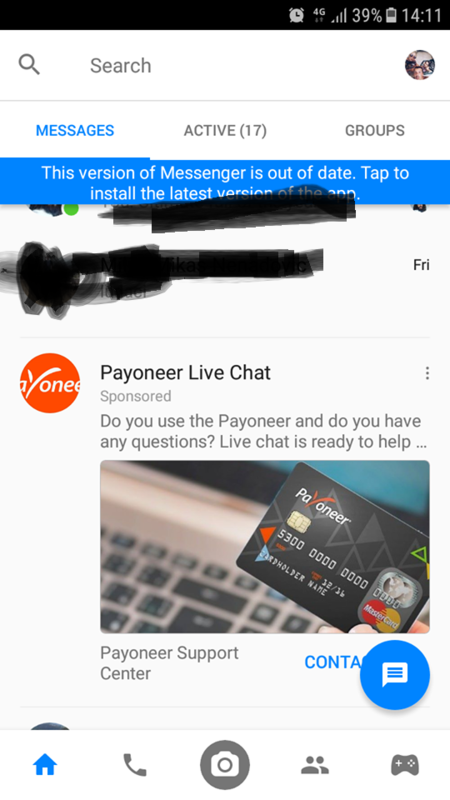 This morning I got an ad saying that Payoneer support is just around the corner and if I have anything to ask I should just follow the link from the ad. Here it is. 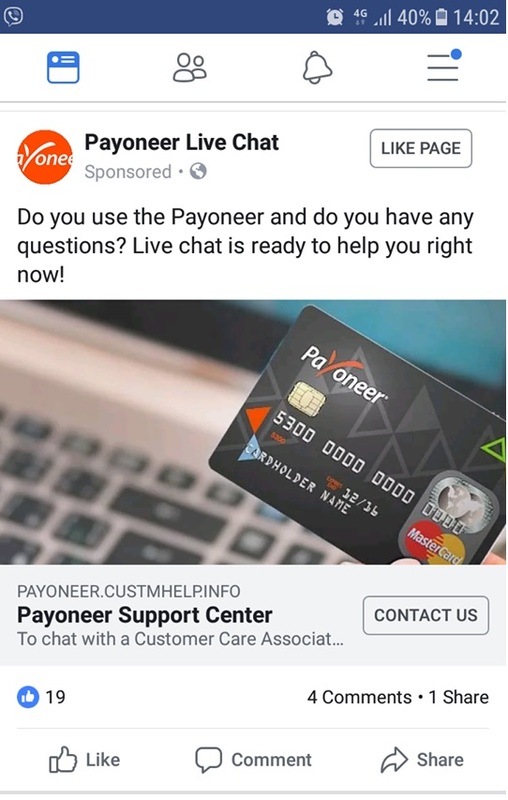 For those who aren't aware, Payoneer is mostly used by freelancers. It is a banking service that handles most of my online earnings and I can use their card on any ATM in the world. Pretty sweet and very secure (as far as I am concerned). I was curious to see what this page has to offer and to make sure that Facebook MANUALLY approved a phishing scam. Indeed I was right. The websites asked for my login info instantly while that isn't the case on the original Payoneer support page. Phishing scam indeed? Let's take a closer look. People who work at Facebook on ad approvals, take notes, it's not that hard I promise. https://whois.icann.org is all you need. Put the url in the search bar and take a look at who registered this badly worded domain. Do you see anything strange here Mr. ad approval man? You are correct, all of it is strange. Now for the tricky part. You will have to use Google and search this address and see what comes up. The thing with these phishing pricks is that they are lazy and reuse their fake info more often than you think. As it turns out, this same person registered an Ant Miner shop back in 2017 with the same info. Needles to say, it was also a scam as reported on Bitcoin talk. Was that enough info to make you realize that this is a phishing scam that your users might fall for and lose their hard earned money? While I was writing this I noticed that you are serving me the same ad in the Messinger app as well. This is not a joke. People will fall for this and I am sure Facebook won't be the one to blame. Banning ICO promotions to jump on a bandwagon was obviously just that. The truth is that you people don't care about user security as you won't give them back their money once this lowlife scammer takes it from them via ads that you served to that same user. nice 1 , thnx for your time. I am seriously not a fan of facebook and only have an account as my workplace "requires" you to have it, as well as Whatsapp as they use it to communicate with staff on various sites. I sort of understand the removal of ICOs due to the numerous scams, but firstly they are missing out on the many amazing projects out there and more importantly they show yet again their double standards on many dodgy ads displayed. Just another reason to migrate to steemit that is gradually turning into a one stop shop for blogs, videos (via dtube ect..) and I can see soon social equivalent to facebook also. Wow! Thank you for warning me about this kind of thing. Unlike many people on this website, I know very little about this sort of thing. I probably would be stupid enough to have fallen for this scam. I can't believe an actual phishing scam is approved to be on Facebook when someone like Tommy Robinson is banned smh.